Here is Chapter One, to give you the beginning of the story. Esther knelt on the floor of her still room, the one place she would be undisturbed, and forced her fingers to uncurl. The scrap of parchment in her hand dropped to the tiles she had so proudly swept that morning. She did not need to read the letter again, since its terms were already seared into her mind. I offered Sir Bertrand D’Acre an insult for which he challenged me. As I have still a broken arm from a previous duel, my place was taken by Sir Henry Leafton, who fought as proxy as my champion and won. Sir Henry asks to be remembered to you. He met you at court last midsummer with your then husband Sir Edmund. As you are now a widow, Henry wishes to court you. I have agreed to the match. The day after you receive this letter from my herald, Sir Henry will call on you. You will know him. You will be obedient to him. Be ready. We owe him a great debt. The parchment scraped along the edge of the table where she made her cordials. Stephen had not written the note—he could scarcely sign his name—but it was his way of speaking, no kind of greeting or salutation, bluff and brutal and always to the point. “I am to marry again,” she whispered, through frozen lips. The line, Henry wishes to court you, was nothing more than a pretty fiction, as Stephen had already offered her to the champion who had saved his life. Her forthcoming nuptials were as good as settled. Esther’s racing heart felt as if it flipped over in her chest as her skin chilled. Memories of bellowing Sir Edmund, of their vile wedding night, of their horrible, short marriage, battered through her afresh and she closed her eyes, willing her slight, trembling body to be still. As a widow she had been independent, looking after her small estate, making her cordials and ales, taking care of her two old retainers, few estate workers and page, beholden to no one. And now, with a few foolish words, my younger brother ties me back into wedlock. I know Stephen and how his tongue runs away with his wits. Because he could not resist making a cruel remark, he lands himself in trouble, and yet he is not the one who pays. In what way do I owe this stranger, this Sir Henry, a great debt? He did not save my skin. Esther snatched up the hectoring note—and how typically selfish of Stephen not even to give her the illusion of a choice, not even to have his herald wait for her reply—and crushed it beneath her heel. Her voice rang in the small chamber but no one answered. Through a gap in the window shutters a bee droned into the room and out again. Esther felt that it had taken the spring-time with it. Handsome, blond, curly-headed Walter, her own age of nineteen, a good man, a squire and, more frequently of late, a messenger and herald. He served neighbors of hers, Sir Richard and Lady Constance, and always lingered a little when he delivered messages from them. He praised her cordials and teased her in a gallant, sweet way, calling her “Mistress Bright Eyes” and “his nimble-fingered physic”. He gossiped like a magpie and was less than kind in his quips about her old retainers, but she liked him. Walter respects me. My brother would say he is a landless squire, ready to flirt with any woman with a little riches, but Walter has never demanded anything of me. At night in her narrow bed, Esther sometimes imagined running away to the crusades with Walter, of their making a life together in the mysterious east, or the Mongol court. That pleasant day-dream must be over. I have to marry Sir Henry. Esther resumed grinding coriander, ginger and cardamom to make her compost, the chutney that Agnes and Adam liked and that Walter said went well with all meats. Bent over the mortar, the swirl of sweet spices no longer making her smile, she tried to recall every Henry she had ever met. Harder than it seems, since Henry is a popular name. A dark face tumbled like a leaf in a breeze through her memory. Esther crushed another batch of coriander seeds and let the ghost flit back to her again. A time at court last spring, when the cuckoo had just begun to call, as now. The great hall at Winchester, fragrant with fresh strewing herbs and colorful with the king’s wall tapestries. She had been hurting, because Sir Edmund had beaten her the previous evening, blaming her for his impotence and for not gifting him an heir. Colliding with the edge of a trestle, she had been unable to disguise a wince when a cloaked and hooded stranger had clasped her hand and softly drew her aside, shielding her from her stomping husband. “Be well, my lady,” the stranger wished in a low voice. Tempted and reassured by such rare kindness Esther had peeped up into his hood—and seen the face of a demon, pox-scarred and livid. He had cold blue eyes and haggard features, pale where they were not ridged with black pits and broken veins. Lanky and gray as a heron, he melted away into the crowds of knights and stewards before she could apologize. When Sir Edmund jabbed her bruised side and hissed at her to attend him, Esther had tried to forget her ill manners, although Sir Henry’s ruined, burnt-looking features had haunted her dreams for several nights after. “Plain Harry,” he was known, throughout the court. She had spotted him the following day, a head taller than most and always courteous, ignoring gasps and rude finger-pointing and striding gracefully through the press of courtiers with that crooked smile and keen eyes that missed little. Including herself, it now seemed. I remember him. And clearly he still remembers me. The pestle dropped from her nerveless fingers and Esther wrapped her arms about her middle, trying to rock for comfort. What can he want with me, except revenge? But revenge for what? For what my brother did or for some unknown insult I gave him? What? Plain Harry knew he did not suit his nick-name. He had been plain before the pox had scarred him at eight years old, but now he was ugly. Gangling, too, and it did not seem to matter that he moved smoothly, stealthily if need be, or that his hair was blacker than a midwinter night and curled whenever it was damp. 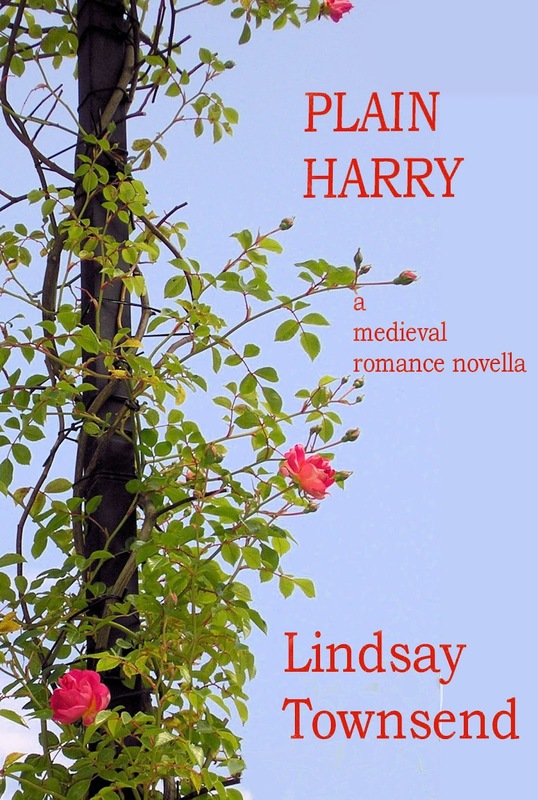 I do not fit the name Harry, either, he thought, presenting himself at the widowed Lady Esther’s sturdy manor house. He watched patiently as the old watchman limped off across the modest great hall to fetch his mistress. Harrys were kind, hearty, shoulder-slapping fellows, always part of a mob. He was solitary by nature, a lover of books and wild places, desires sharpened by his appearance and by the way his father flinched and his mother lamented his loveless state each time he returned home. He had flung himself into military training, if only because a helmet covered his looks. On the battlefield no one cared if he could not dance, or compose a love poem, or swear undying devotion to a damsel who would doubtless go shrieking off to a convent if he tried. In a melée his lanky frame and long reach were an advantage. War had also taught him how to take notice. At court, twelve months back, he had seen Lady Esther shrink slightly each time her boorish husband addressed her. He had noticed her stumble once, blushing wildly, and jerk back as if burned when her flank grazed a table. He had reacted then without considering his visage, offering her his arm as support. Her pink and pretty lips had parted to say thanks and he had felt normal for an instant, until her wide brown eyes met his. Harry slammed his hands behind his back and let his fingers play tug of war against each other. Even with the strains of dread and regret shadowing her clear-cut features, and the bruises at the sides of her head which she had tried to hide with her veil, Lady Esther had been flawless, a delicate beauty whose natural cream and roses complexion contrasted cruelly with his own craggy, ugly, black looks. So why am I here at her home? Because, last summer, he had glimpsed not a morsel of disgust in her pale, shocked face. And because he sensed that, widowed or not, the lady needed help. 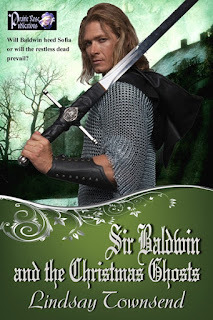 Her fool of her brother was already using the promise of her hand as a means to save his own skin—Sir Stephen had done it with him and Harry had no doubt that were he not to marry Lady Esther, Stephen would offer her out again. ‘Tis a pity womenfolk have so few rights against the men of their families, but such is the unkind way of the world. Harry shook his head, unsure if he would have ever entertained such ideas had he not been uglier than a troll and subject to the bitter way of the world himself. Yet he had ridden to this compact jewel of a manor not solely for sympathy. Admit it man, this is the only way you will win a wife. He was rich in war-loot and tournament prizes but as a younger son would not inherit the land that all damsels demanded in return for their wedlock. Harry could not fault them. You could build and grow on earth but never on gold, however prettily it gleamed. Pray God the lady here considers that last point about me, that I can keep her and her good land safe, better than most handsome squires or knights. Harry knew that was unlikely but he could hope. His breath hitched as the red curtain to the private solar, the little chamber at the back of the great hall, drew back and Lady Esther emerged. Glorious. She made the word real. The bruises and hurts she had endured under her old husband were gone now and she shone like a harvest moon, her eyes brighter than polished bronze, her hair—the glimpses he could see beneath her modest white head-veil—a rippling mass of chestnut, shot through with tawny. Small and slender she came toward him, silken as flowing water, an image enhanced by the green-blue gown she wore, a color Harry knew had been fashionable at court a year ago. She did not smile but the sight of her graceful shape and movement was enough. Harry’s body reacted as it had not done since he was fourteen and an easily aroused and blushing squire. Why now, by Christ? Is it so long since I have been with a woman? Despising his looks, Harry was no gallant or regular user of the stews, but even so this ardent reaction was embarrassing. Praying that his interest and urgent physical response did not show, he flung his cloak loosely about his rangy figure and gave a low bow. “My lady.” His voice sounded less its usual music, more of a rasp. 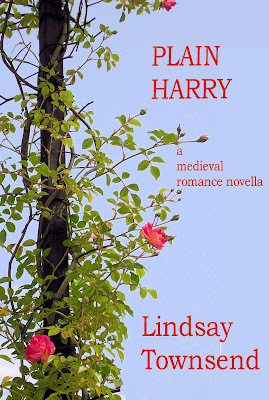 Dazzling and distracting as the planet Venus, she turned, then Harry heard her soft footfalls shifting through herbs strewn on the hall floor, stirring up a scent of lavender as she walked back to the curtain. Recollecting his scattered wits, he strode to catch up and passed through a tiny solar, the watchful warrior in him seeing a small weaving loom, a spindle, a narrow chest and a canopied bed before he had to duck to avoid a doorway lintel . Shifting sideways through the low arch, he blinked at the bright chamber beyond. Painted flowers tumbled round the walls, while under painted trees brightly rendered unicorns and dragons gamboled up to the roof rafters, drawn at play as if such creatures were as carefree as the spring lambs bleating outside. Harry swiftly shut his open mouth and saw, with new admiration, the many flasks, jugs, basins, sacks of dried herbs and tables of knives, pestles, and mortars that he guessed made up a good still room. The air was heavy and sweet with the tangs of rosemary, cinnamon, sage, lavender and bitter orange peel, and a rainbow array of cordials in heavy glass flasks lined the shelves behind Lady Esther. Her low voice touched on a scandal. On his death-bed the wretched Sir Edmund had attempted to deny the now-orphaned lady her widow’s portion because she had “failed” to provide him with children. Luckily, Sir Edmund’s adult son Richard was more honorable than his father and had released the bits of land into her care. The modest manor house was her own dowry, the only part of her family legacy that Sir Stephen could not touch. Her former son-in-law but not her brother, Harry noted. Clearly Richard had little faith in Sir Stephen defending the rights of his sister, and neither had he. To that end, Harry knew he should raise the issue of marriage, but when? To do so at once was surely too unmannerly. To his surprise the lady raised the matter. Her voice was calm but her hand trembled as she lifted a jug from a small brazier and poured two cups of gently steaming tisane. He took a cup from her, touching her fingers briefly in an attempt to reassure—why he was not sure, only that he was keen she did not think him a bully. Unsure how he looked when he showed his teeth, since he had no mirrors and did not waste time peering at his reflection, he did not smile. And you will be beleaguered and nagged to death until you choose what he demands. Was that yearning he caught in her voice? To give her a moment, Harry took a sip of the tisane, giving a tiny huff of pleasure when the blended taste of raspberry, orange, and strawberry hit the back of his throat. Should he say what he wanted to admit? Why not? She longs for a family, a home, children, and so do I. A marriage between us could be a way. In truth he had ridden to Lady Esther’s manor to release her from her brother’s cruel expectations. Seeing her afresh and learning that his repudiation would not save her from other, possibly harsher marriage suitors, was forcing him to reconsider. He leaned forward, drawn to her bright boldness, and was saddened when she flinched slightly. Yes, you have been struck before, my lady, for you to show such a honed reaction. He took another sip of her very fine tisane, allowing her another instant to compose herself. “Why should I?” The instant he answered, Harry wanted to flay himself. Of course her old husband had probably objected. Sir Edmund had wanted her as a breeding mare and no more. “I stitch gauntlets,” he added, an undertaking he had the tools and strength in fingers for, and one his comrades in arms had learned not to mock. “I would be interested to see those.” As if she had admitted something unseemly, Esther blushed afresh. 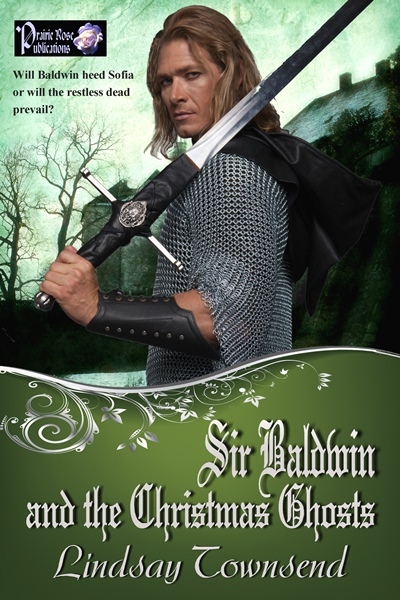 If you enjoy sweet medieval historical romance, please look out for my novella, "Sir Baldwin and the Christmas Ghosts," also just 99 cents or 99p. You can read more about the novella here. I enjoyed reading your excerpt Plain Harry. Lovely writing, very likable characters, an intriguing story. I'm enjoying your book, Plain Harry. It was easily downloaded from Amazon.com on my Kindle for iPad app, safe and secure. The writing is excellent rich with history and feeling. The plot is engrossing. Thanks so much for sharing your talents with readers. Thanks so much for your kind comments, Cat and Miss! Very much appreciated!